In the fourth of a series of blogs looking back at the history of The King’s Fund in celebration of our 120th anniversary, Lynsey Hawker explores the work of the Fund’s Revenue and Propaganda Committee from the late 1920s into the 1930s. Before the advent of the National Health Service, most hospital care was provided by voluntary hospitals, funded by charitable donations. Demand for beds, the increasing costs of medical treatment and a decrease in charitable contributions after World War I meant that by the 1930s the voluntary hospitals were struggling. At this time, the main aim of The King’s Fund was to raise money to support these hospitals, so the Fund set up a Revenue and Propaganda Committee with the dual purpose of raising funds and raising public awareness of the value of these institutions. As the Prince of Wales noted in a speech at the Fund in 1927, ‘in this age of publicity, hospitals and those interested in them, […] are learning the value of not merely rattling cash-boxes but also of telling the public the work they are really doing’ (p 45). The Committee members included some famous names, including actor Sir Nigel Playfair and the economist and social reformer William Beveridge. Due to their influence, the Committee was able to organise an impressive range of fundraising activities (p 44) including a seven-a-side rugby competition, guided tours of St James’ Palace and talks given by well-known names, such as author Pett Ridge and cricketer PF Warner. The Committee also organised a series of ‘lectures and counter-lectures‘, where members of the public could buy tickets to hear celebrities of the day debate different topics. The series included a debate between journalist EB Osborn and author HG Wells entitled ‘Should history be taught on a national or international basis?’. Other debate topics were varied and at times controversial: titles included ‘Is the House of Commons any use?’ and ‘Is a woman’s place in the home?’. The latter was broadcast live by the BBC, causing quite a stir at the time. Audiences heard author Rebecca West argue that ‘it is chiefly for men – who are so rarely in it – that the home has this peculiar glamour’ in a debate against Alfred Duff-Cooper MP. In 1928, the Fund again took to the airwaves on the BBC Radio programme ‘The week’s good cause’ – a forerunner to the BBC Radio 4 Appeal. The broadcast was a five-minute appeal delivered by the Lord Chancellor, aimed at encouraging people to donate to the Fund. The broadcast raised an estimated £700 – the equivalent of around £38,000 today. In 1929, the Committee commissioned the building of a miniature hospital, with the aim of educating the public about what went on inside a modern hospital and motivating them to help pay towards the upkeep. Built in the early 1930s, the model was inspired by Queen Mary’s doll’s house. The hospital was built to scale and included an operating theatre, an x-ray department, wards and a working lift. 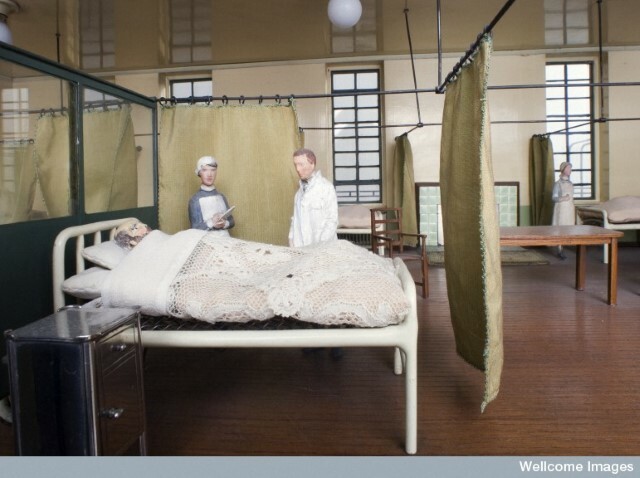 The Queen was so impressed with the miniature hospital that she donated her lace handkerchiefs to make bedcovers. The model was revealed to the public by the Prince of Wales in January 1933 and later toured the country. Today the model is stored at the Science Museum in London. 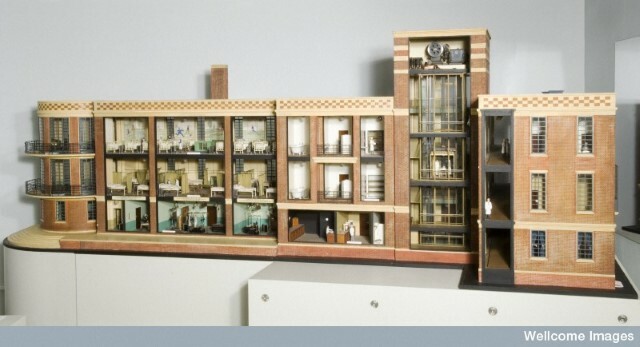 While no longer on show to the public, further pictures of the model can be viewed in Wellcome Images’ collection. 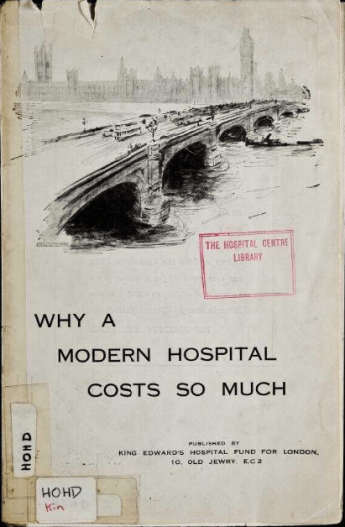 In 1934, the Committee published a report on ‘why a modern hospital costs so much’. This report laid out the latest advances in medicine and health care and encouraged the reader to support their local hospital or donate to The King’s Fund to help pay for these improvements. In 1936, the report was brought to life in a film commissioned by the Committee. ‘The war without end’ gave an insight into developments in anaesthetics, x-rays, infection control and aftercare in hospitals. The film opened in Leicester Square theatre in 1937 before being shown in cinemas across the country. During this period, the Fund was also beginning to develop its research into best practice in health care. The Patients’ waking hours report, published in 1931, was an early example of the type of work The King’s Fund would become better known for in years to come. Looking at the results of a survey analysing different patient waking times in hospitals in London, the report makes recommendations for a standard time for hospitals to adopt, concluding that ‘the most suitable hour for the waking of patients is 6 o’clock’ (p 9). Future blogs in this series will continue to follow the changing role of The King’s Fund as it moved away from its initial aim of raising money for voluntary hospitals and began to focus on developing best practice in health care following the advent of a new National Health Service.